We are very excited to announce the launch of ACTRA Toronto’s new podcast, entitled ACTRA Spotlight. As the name implies, our new podcast is about performers and by performers. ACTRA Spotlight will be co-hosted by Jean Yoon (Kim’s Convenience) and David Gale (ACTRA Toronto Vice-President) and they will be chatting with Canadian performers and others in our industry about their stories and work. Plus, we’ll feature the latest news and updates so you stay on top of everything happening at ACTRA Toronto. 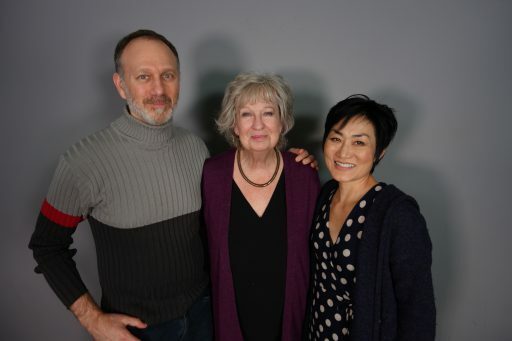 Co-hosts David Gale and Jean Yoon with guest Jayne Eastwood. In our inaugural episode, we are thrilled to have a conversation with 2019 ACTRA Award of Excellence recipient and Canadian screen legend Jayne Eastwood! Jayne talks about her start in the business in the famous Goin’ Down the Road, to her time with SCTV, her favourite roles and much more. You can listen to and subscribe to ACTRA Spotlight now on iTunes, Google Play, Stitcher or TuneIn. Please subscribe, rate us and recommend us to your friends and colleagues!